He always underestimates the importance of stuff. Whatever it is. 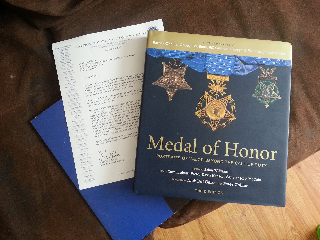 This time it was a Medal of Honor. They had a ceremony for him. His parents came. So did my dad and his sister's Hannah and Becky. Jared was there and so were our neighbors. I'm grateful for them all taking the time to come. He applied for a scholarship from this association and for the application to be processed, he had to give it to his colonel. Well there's this part of the application where the colonel can nominate him for this cadet Medal of Honor award. Well he got it. It includes a scholarship and the prestige of it all. He got it because he is amazing. In so many ways. Lol. Bragging much? 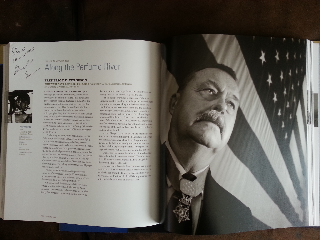 A real Medal of Honor recepient flew in to give it to him. There are only 80 alive today. Most are given posthumously. I'd really like to post a video of it. Jared? Mom? Dad? Can you help with that? Only one cadet from each branch of the military gets it each year. They usually don't come to a school twice. They did however have a winner back in 2008 or so. Its a big deal though. They gave him a real silver coin and I don't know where he hid it so I can't post a picture. But the guy in the book is the one who came to give him all the stuff. Awesome. I think the best part was watching the cadets do their regular thing. They did the army creed and did some marchingish things. So then we got to celebrate with dinner at the Olive Garden. Happiness. I love my family and friends and I'm super thankful for all of them. I'm also proud of my bad ace husband. He would be super embarrassed if he knew I was posting this. But it needs to be written down. So here it is. yay for your bad ace hubby! YOU GUYS ROCK!! I love you. and your new layout.